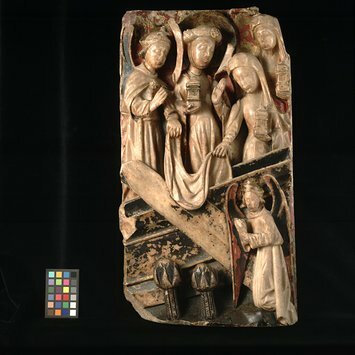 This alabaster panel is representing the Three Maries and the Sepulchre, made in 15th century in England. Mary Magdalene, haloed and wearing a barbette, a fillet decorated with a brooch and a sideless surcoat over a dress, stands in the centre of the panel behind the tomb. Her head is inclined to the right, her left hand raised, and she holds an ointment pot in her right hand. A second female figure veiled and wearing a close-fitting gown stands on her left, holding an oinment pot in her left hand and leaning to pick up the shroud from the empty tomb. The third Mary, also holding an ointment pot, stands behind her in the top right-hand corner of the panel, looking down into the tomb. An angel wearing a tiara surmounted with a cross front and back and a cloak fastened with a brooch, stands behind the tomb on the left of the panel, holding the shroud in his left hand. His right hand is raised, with a scroll on which the original painted inscription is no longer legible. Another angel, wearing a similar headdress, kneels in front of the tomb, beside the lid which is set diagonally against it. Two curious stylized trees, presumably representing palms, are carved in front of the tomb on the left of the panel. The top right and lower left corners of the panel are missing. The left corner of the tomb is chipped. Red paint and gilding remain on the background at the top of the panel, the red paint here seeming to be the primer for the gilding. Slight traces of the usual daisy pattern remain on the heavily darkened green ground. The two angels' wings are painted red and black with a little gilding. The halo behind Mary Magdalene is gilt on a now darkened blue. Traces of gesso knobs are on the upper background. There are three lead-plugged holes in the back of the panel, one with latten wires attached. The bottom is cut away. There are four parallel marks incised. Acquired by Dr W. L. Hildburgh in Paris. On loan to the Museum from Dr Hildburgh since March 1950. Given by Dr Hildburgh in 1950.